Published: Thursday, October 22, 2015 at 4:07 p.m.
Community partners will help Easter Seals of Southwest Florida raise awareness about the service it provides to people with special needs and their families. Un-Forked, which is being called a “grazing” event, will feature restaurants and food vendors highlighting locally grown produce, herbs and beverages. 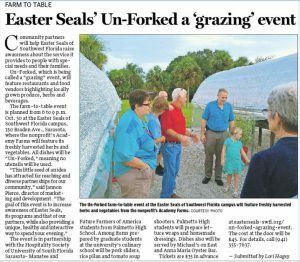 The farm-to-table event will be from 6 to 9 p.m. Oct. 30 at the Easter Seals of Southwest Florida campus, 350 Braden Ave., Sarasota, where the nonprofit’s Academy Farms will feature their freshly harvested herbs and vegetables. All dishes will be “Un-Forked,” meaning now utensils will be used.